As promised, another blog entry about the material that I need to read for my tutorial. 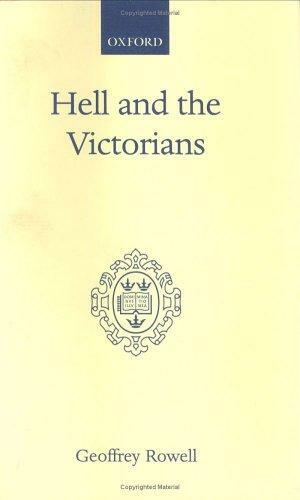 The subject of this post is Geoffrey Rowell's book Hell and the Victorians and will deal with the different views on hell as well as eschatology in the Victorian era. In his Hell and the Victorians Geoffrey Rowell provides a really wonderful summary of the Victorian debate on hell, as well as eschatology in the more general sense. Rowell introduces in every chapter a different religious view on hell and eschatology, thus creating a very systematic overview for his readers. However, by discussing the most influential authors per religion Rowell shows that the divisions between the different religions are not always clear cut and that the opinions held by authors who belonged to the same religion did not always coincide. Be this as it may, Rowell has enabled me to make an actual schema of the different religious views on afterlife. However, although I realize that the schema (see attachment 1) necessarily generalizes the situation quite a bit, making it has helped me to come to terms with my subject. Perhaps the most interesting feature of this overview is that it shows the great difference of what determines if one is saved or not per religion. Even Protestants greatly differed on this subject as the Calvinists believed in Predestination (those who are predestined to be saved will be saved the others are doomed), the Arminians believed that salvation was offered to all, but had to be accepted by the individual and the Lutherans believed that only those who had faith would be saved. What I found rather confusing whilst making this schema was that Rowell actually stated that the ‘adherents of systematic conditionalism [i.e. the saved will go to heave and the doomed will be annihilated] were almost entirely to be found in the Augustian Calvinist tradition’, even though he had placed conditionalism under Unitarianism in an earlier chapter (205). The same happened with regard to universalism; Rowell first identified it with Unitarianism and later stated that the most advent supporters of this religious view were the Evangelists. But maybe this illustrates just how how thin the lines between the different religions actually were. Something which greatly surprised me was that the Roman Catholics were the only ones who did not believe in a literal resurrection of the body during the Last Day (i.e. the apocalypse). I had expected that scientific developments would have led people to interpret the resurrection of the body in a more spiritual sense, as I found it hard to believe that people who knew of bodily decomposition actually believed that such a body could magically be made whole again by Jesus. ‘The sweet goodness of God sheds the rays of His mercy even in hell. A man who has died in mortal sin deserves a punishment infinite in pain and infinite in duration, but God and His mercy has made it infinite only in duration, and has limited the amount of pain; He might justly have inflicted a far greater punishment than He has’ (as qtd. in Wheeler 164). This passage, however, is clearly about hell and not about the purgatory. As a result, the references to this doctrine throughout the chapter lead to confusion, especially when it is compared to other theological views on the purgatory. Other than the slight inconsistency in his use of terms, however, Rowell has succeeded in creating a systematic and accessible overview of Victorian debate on hell.